Indian textiles resonate with traditions. Every minute thread, warp and weft, is a piece of history. Over the years, with the influx of multicultural sensibilities, and debates around fast fashion and sustainability gaining momentum, it may seem like the focus on Indian textiles has diminished. 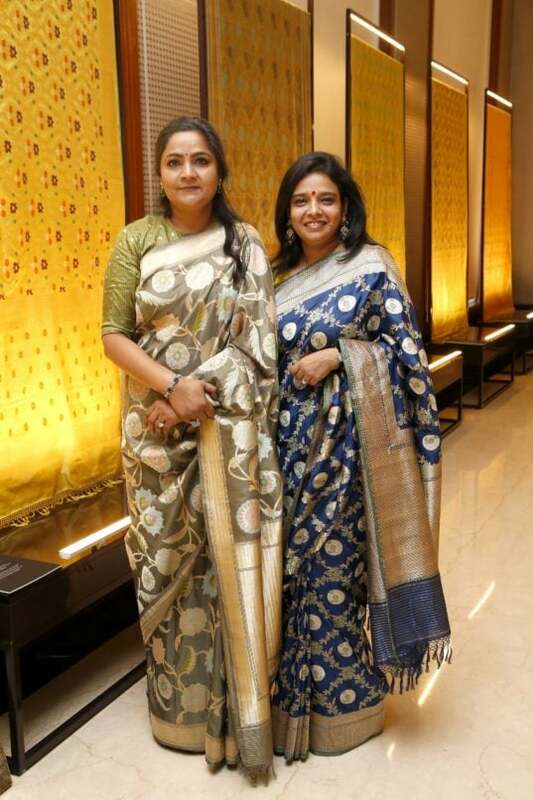 However, Kolkata-based textile preservationists, designers Swati Agarwal and Sunaina Jalan, are keeping the conversation going. They have been committed to the cause of preserving traditional textiles, making them customer friendly, and imparting knowledge to aficionados, for years now. The sari label Swati & Sunaina is rife with intricate traditional weaves and designs, a testament to their devotion to the cause. You may have gasped over their exquisitely crafted ‘shikargaah’ drape on Kangana Ranaut or an intricately done sari adorned by Aishwarya Rai Bachchan. Their latest initiative is ‘Between land and the sky, woven gold from Gyaser tradition’, an exhibition presented by Czaee Shah, curated by Monisha Ahmed, with scenography by Mayank Mansingh Kaul. The showcase traces the origin, journey, and history of Gyaser, a silk-brocade fabric, characterised by the use of gold and silver threads, and richly patterned with Buddhist and Chinese symbols representing long life, protection, and prosperity. The unique fabric has its own technique, colour palette, and patterns, and is one of the most densely woven designs in the Indian tradition. 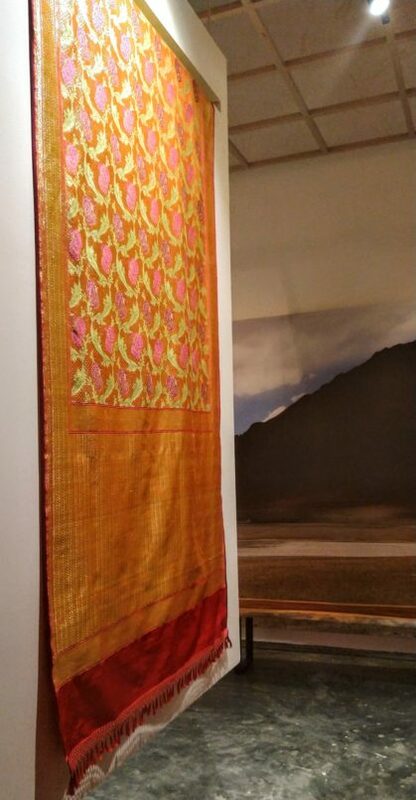 Agarwal and Jalan understand how interesting Gyaser is, and have worked with it for a few years now to make the weave suitable to be draped like a sari (traditionally, it is too thick to be draped). “We were mesmerised by the fabric’s inherent qualities and visual aesthetics, and worked on recreating the boldness and expressiveness of the traditional Gyaser in a new idiom, and for the first time, translated the Gyaser weave into saris,” says Agarwal. Their first challenge was to make it light and drapable. “Since saris use pure zari, there is a constant need to balance this with fine silk, which requires constant engagement with the master weaver”. A special zari was created in pure silver and electroplated with 24-carat gold to achieve the bright tone required in a Gyaser textile. These path-breaking designs are now a part of the exhibition. We spoke with Monisha Ahmed, an independent researcher who has worked extensively on material culture and textile arts of Ladakh, to understand what we can expect from this one-of-a-kind showcase. What is the story behind ‘Between land and the sky, woven gold from Gyaser tradition’? We wanted to give the audience a feeling of cultural and historic connections between Ladakh and Tibet. For the exhibition, we chose a selection of textiles that are examples of Gyaser, and narrate the history of the fabric. We also wanted to show how the richness of the Gyaser fabric plays out against this backdrop of barren mountains; how Gyaser become a devotional offering in monasteries and at altars. We then wanted to show the innovations that have taken place around the traditional fabrics, and how Gyaser has been transformed from a devotional fabric to one of fashion, with the intervention of Swati & Sunaina. We have a small collection of vintage textiles, each representing a different aspect of the story. A Qing dynasty dragon robe telling us about China and the origins of silk and the fine embroidery craftsmen were practising. Then moving on to a silk brocades, we have brought in textiles used in the monastery and pieces worn by aristocrats who could afford these luxurious textiles. Then there are exquisitely crafted saris by Swati & Sunaina. How did you work in conjunction with Swati & Sunaina? Swati & Sunaina wanted to present the story of Gyaser, its history and origin. They wanted to bring out the connections over regions, how traders have traversed unfavourable geographic terrains and how the tradition flourished. When you look at their saris, you are also learning about the journey traversed by fabric – how it developed, how it was used. I think what’s important here is that Swati & Sunaina are acknowledging that history and know-how that was passed on from one generation to other. What do you think makes Gyaser weave one of a kind? We were mesmerised by the fabric’s inherent qualities and visual aesthetics, the boldness and expressiveness of the traditional Gyaser. It is a one of a kind fabric as it has its own technique, colour palette, and patterns. Among the various silk and metallic brocades of the Indian subcontinent, Gyaser is the most densely woven, using a complex technique of discontinuous supplementary weft. The word is also traditionally used as a trade term for a particular type of silk-brocade fabric patterned with Buddhist and Chinese symbols such as lotus flowers, dragons, phoenixes, the thunderbolt, clouds, and mountains. What were your biggest challenges in putting up the exhibit? To recreate the landscape of the Himalayas; to give viewers a sense that they were stepping into this vast expanse of space that is stark and barren. And then to it contrasts with the bright hues of the Gyaser. Another challenge was to exhibit the process behind the refinement of the fabric and its many uses. ‘Between land and the sky, woven gold from Gyaser tradition’ opens at Gallery Maskara, Apollo Bandar, Colaba Mumbai, and will be on from April 17 – 20, from 11:00 am – 6:00 pm.